What’s Next for Indonesia-Laos Security Ties? Both sides continue to look for opportunities in the defense realm as they develop their broader relationship. This week, Lao Prime Minister Thongloun Sisoulith made his first official visit to Indonesia since assuming his post last year. Though his visit, which included a meeting with Indonesian President Joko “Jokowi” Widodo, focused on a range of areas as both sides commemorated the 60th anniversary of their bilateral ties, they also touched on future opportunities for security cooperation as well. As I have noted previously, in line with the commemoration of the 60th anniversary of Indonesia-Laos relations, we have seen a flurry of activity between the two countries. Security cooperation has factored into some of these broader bilateral discussions, such as the fifth iteration of the Indonesia-Laos Joint Commission on Bilateral Cooperation held in Jakarta in July, led by their two foreign ministers, Retno Marsudi of Indonesia and Saleumzay Kommasith of Laos (See: “Will Laos Buy New Weapons from Indonesia?”). 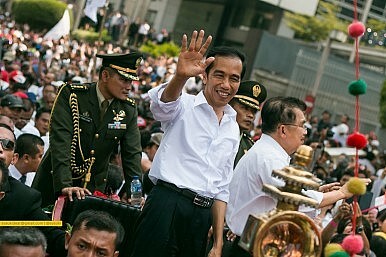 Thongloun’s visit to Indonesia this week saw this dynamic continuing to play out. To be sure, the focus of the visit appeared to be around economics and education, with Thongloun bringing a robust business delegation with him to Indonesia and visiting Trade Expo Indonesia 2017. Both sides also signed two memoranda of understanding (MoUs) on education. But security issues factored in as well. For instance, Indonesia National Narcotics Agency (BNN) head Budi Waseso and Laos Public Security Deputy Minister Somvang Thammasith signed an MoU on the control of narcotics and psychotropic substances. Jokowi, who has taken a tough line on the drug problem in Indonesia, said that he hoped that the MoU would be followed up by concrete steps so that it can actually be implemented and begin to make a tangible impact in both countries. During their joint press conference, Jokowi also mentioned that Indonesia was willing to supply defense items, like airplanes, that Laos needs. As I have noted before, Indonesian state-owned companies such as PT PINDAD have been promoting their products to Laos and claim to have gotten some interest on items like rifles and ammunition. There were no actual commitments made by the leaders of both sides, which suggests that there is further progress that remains to be made. But, as I have noted before, given Indonesia’s determination to develop its domestic defense industry and Laos’ previous experience of buying Indonesian defense equipment, one should not rule out future advances in this area as the two sides continue to advance their broader relationship (See: “An Indonesian Defense Revolution Under Jokowi?”). What’s Next for Indonesia’s Aerospace Ambitions in 2018? A closer look at some of the new opportunities being pursued amid old challenges that remain. Indonesia, UAE Ink New Naval Shipbuilding DealsWhat’s Behind Indonesia's New Explosives Plant?Indonesia, Russia Ink Defense Protocol Amid Fighter Jet DealWill Laos Buy New Weapons from Indonesia?What’s in the New Indonesia Defense Industry Financing Pact?